Though their power had declined, the defensive architecture of the Normans was widely copied across the region in subsequent centuries. The regular stone ‘keep’ became the fortification of choice for those who now held sway. These are often found with little other defences surrounding them. Most date from the 1450's, or later, as development in the late Fourteenth Century was severely curtailed by the impact of the Black Death. 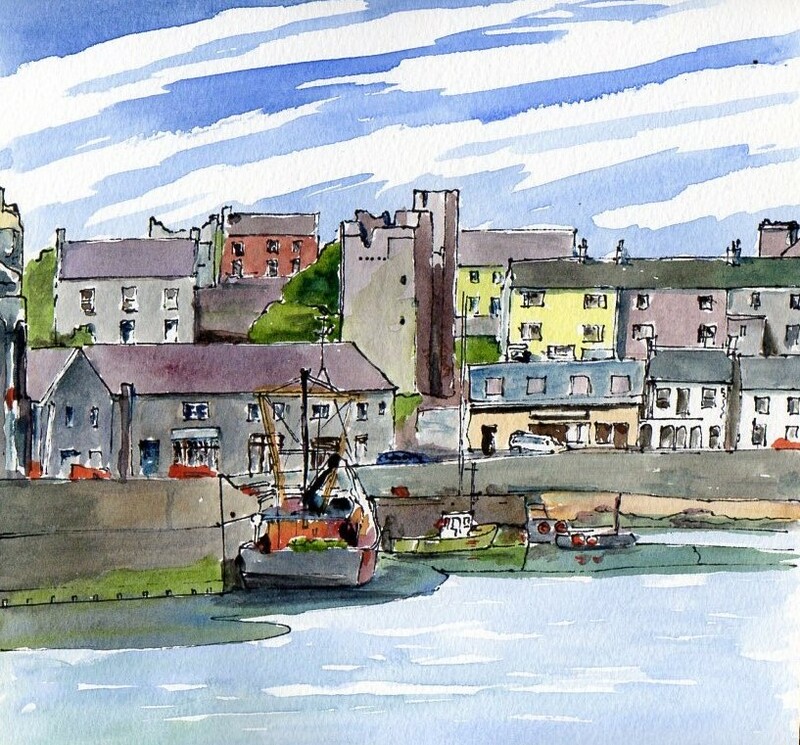 In the east, in the port of Ardglass, a number of tower houses survive within an area that once had its own town walls. A similar pattern was once found at Carrickfergus and can also be found to the south of the region at Carlingford. This reflects the fact that, in these turbulent times, wealthy merchants, in the area of Norman control, were also building fortified homes. In some places, the large castles of the Anglo-Normans were copied by the powerful local clans. 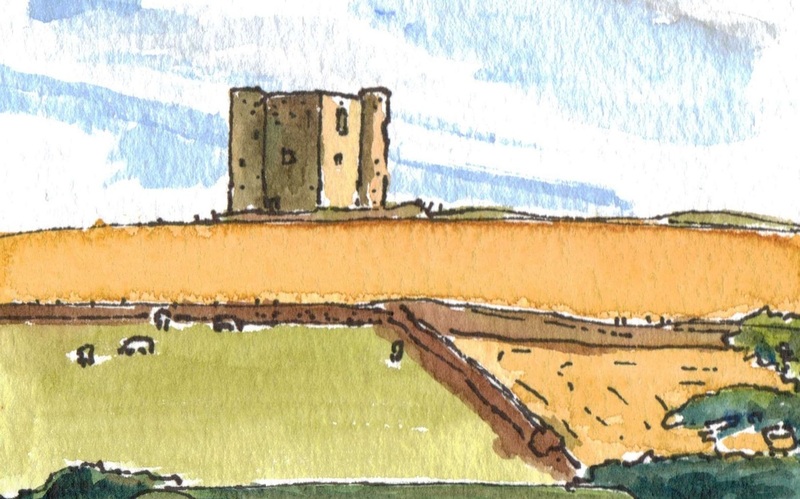 The fragmentary remains of castles such as Enagh in Co Donegal (O'Doherty) or Harry Avery's Castle in Newtonstewart, Co Tyrone (O'Neill), now look like tower houses, but they were once major fortifications. Donegal Castle, Doe Castle in Co Donegal and Enniskillen Castle in Co Fermanagh are good examples of tower houses surrounded by strong defensive walls, but perhaps the best surviving example of this type of development from the Norman form is Dunluce Castle in Co. Antrim. Situated on a dramatic cliff, its detail is heavily influenced by Scottish precedents. Thought to date from the Fourteenth Century, (though some accounts suggest that it may have been a Norman foundation,) it was associated with the MacQuillans and later the MacDonnells who controlled land in both Antrim and Scotland in the Sixteenth Century. Church building also underwent a significant transformation following the arrival of the Normans. Closely associated with the Romanesque Style in England where it is termed 'Norman', their arrival in Ireland was followed by the introduction of the Gothic Style. Inch and Grey Abbeys display the initial ' Transitional Style' of pointed arches sometimes interspersed with the round head windows of the Romanesque. Elsewhere, more developed styles of Gothic are reflected in a relatively small number of new buildings. 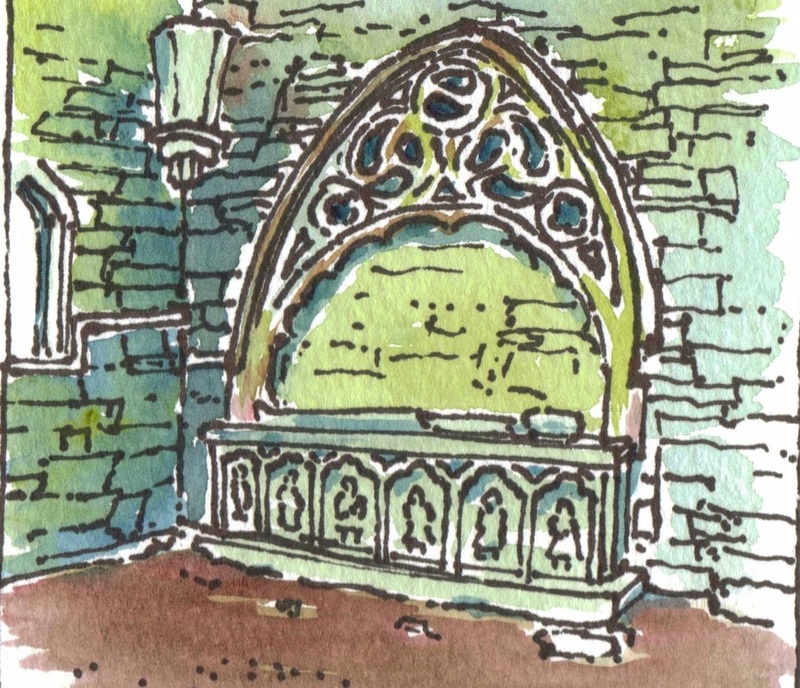 Bonnymargy Friary near Ballycastle has a window which clearly was designed in the 'Decorated Style' of the Fifteenth and Sixteenth Centuries with the remains of scrolls and leafs in its upper portion. A niche in the chancel of Dungiven Priory displays a very developed understanding of the style. It is so ornate that is described by some as being an example of the Flamboyant Gothic Style. It is thought to date from the Sixteenth Century. The Flamboyant was a late development of the Decorated Style. This was adopted on the Continent but not in England where the more vertical Perpendicular Style was in favour. It may be that in more Gaelic parts of the region, Continental approaches were more influential. Equally, because Scottish Gallowglasses (Mercenaries) are depicted under the tomb, this may be an example of another Scottish import.